The evolution of Brandt is to reverse even more trigger types. 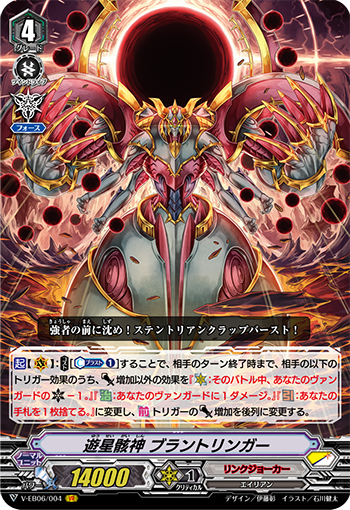 ACT (VC) COST [Counter Blast 1], until the end of your opponent’s turn, change the below effects for your opponent’s trigger effects besides the increase in Power to “Critical: Your vanguard gets Critical-1 until end of that battle. Heal: Deal one damage to your vanguard. Draw: Discard a card from your hand.” and Front trigger Power increase is applied to the back row.